Posted by Nick Prescott on 14 May, 2015. Home lighting can make or break a decorative scheme. This page offers practical guidance on home lighting from our experience of designing lighting schemes over the past 14 years. For effective and inspirational home lighting, you should take a hint from a commercial setting. A top hotel, a restaurant, or a stylish shop will use lighting to excite the senses. 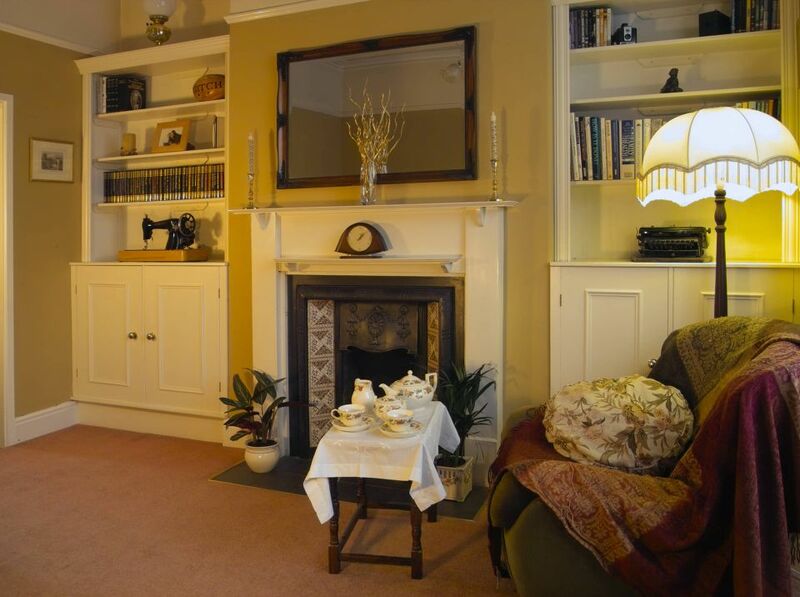 Or a room set in a TV drama – look beyond the action to see how the set-designers have illuminated the scene. You can create a similar sensation in your own home with good lighting design. 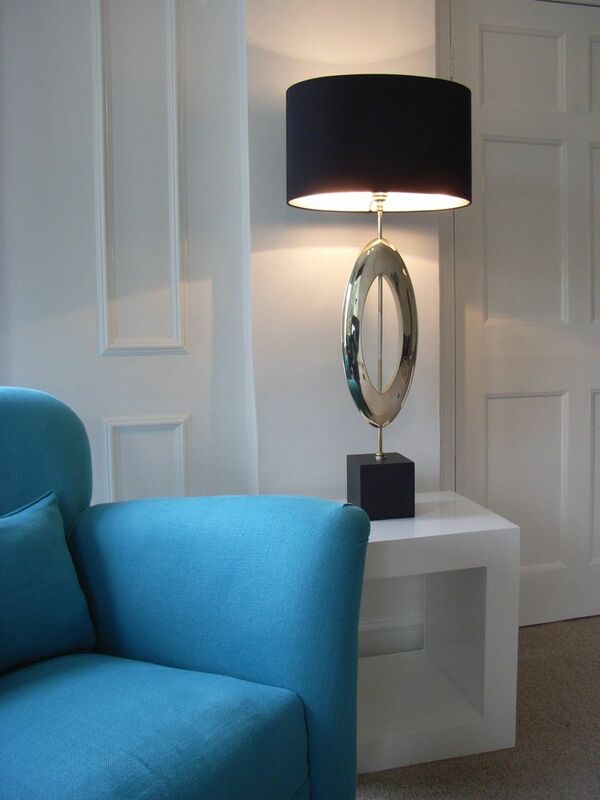 It doesn’t need to be expensive; simply standing a £10 table lamp in the corner of your sitting room can look great. We even hang our white Christmas lights on one wall in our living room all year round, because they give such a welcoming glow. Note: You may hear lighting specialists refer to lights as “lumieres”; this is strictly correct, but we’ll refer to them as “lights” to keep it simple. Also, a “light bulb” should be called a “lamp”, but then we’ll all get confused with table lamps and floorstanding lamps! Good home lighting design answers the following question: what do you want from the light in each space? First we’ll look at this generally, then show you how to choose your specific lighting in more detail. If you are embarking on a home renovation, now is the time to design your electrical and lighting scheme. 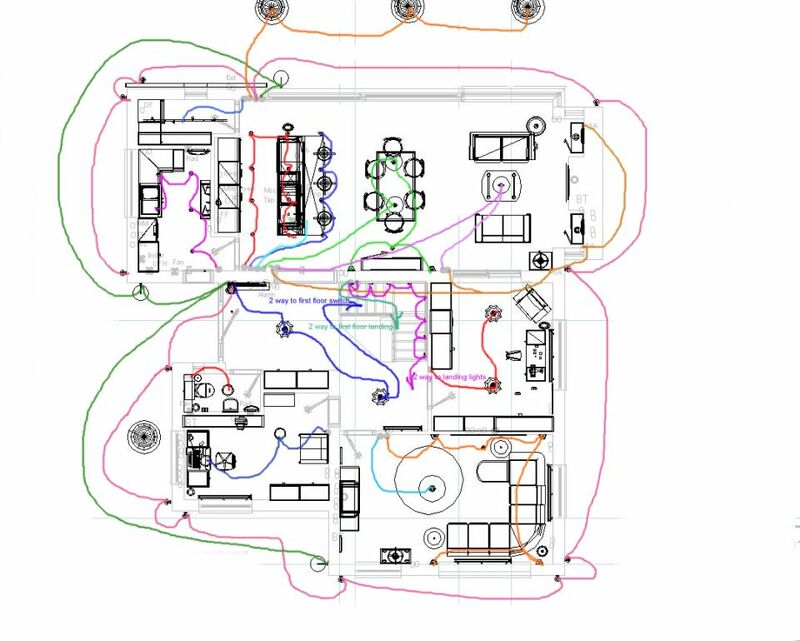 Use a simple overlay to your floor plan (see image below), showing the location and type of each light, circuit and switch, with new sockets for table and floor lamps. Your contractor will want something like this in the specification, and we’ll show you how to produce one. First, find a pencil, tape measure and a sketch pad and draw each room to scale. 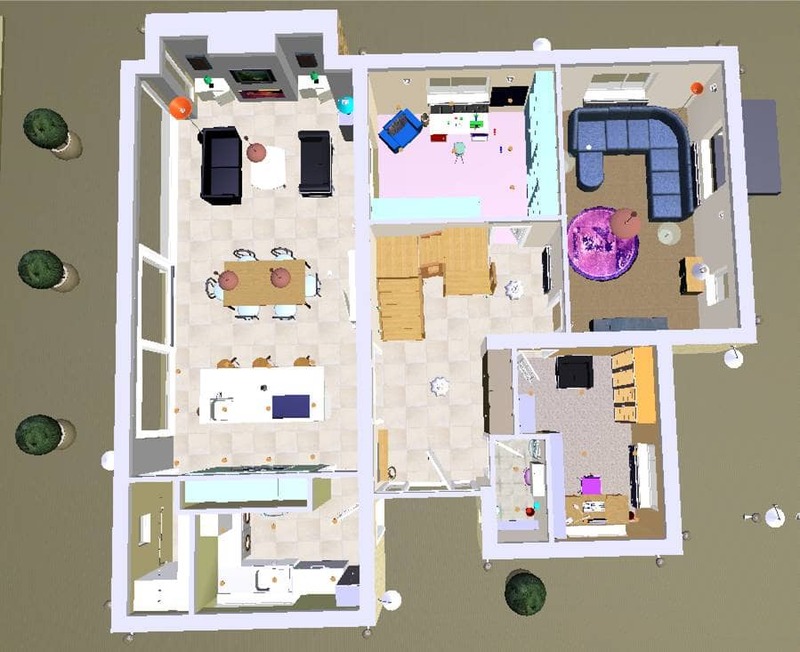 Show the location of furniture and other key features, because this will help you to position lights and sockets. Then think about how you will use each room, and what sort of light you want in each location. Decide what effects you want to create – you may have seen something special in a hotel, shop or in a magazine. Think about any problems you have with your current home lighting, because now you can put them right. If mum always sits in the armchair with her pipe and slippers and reads the paper in the evening, she probably needs a light. Now you’ve worked out that you need some form of lighting in particular places, the next step is to decide what sort of lighting to choose. 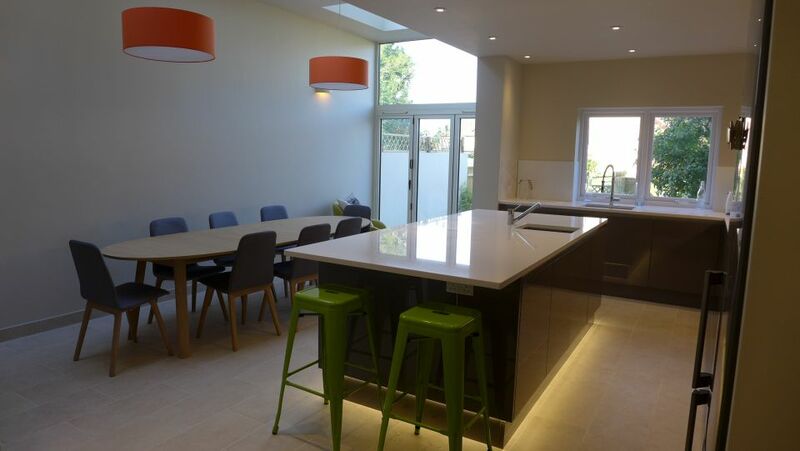 Task lighting – direct lighting to help you to see when cooking, reading, eating, juggling. 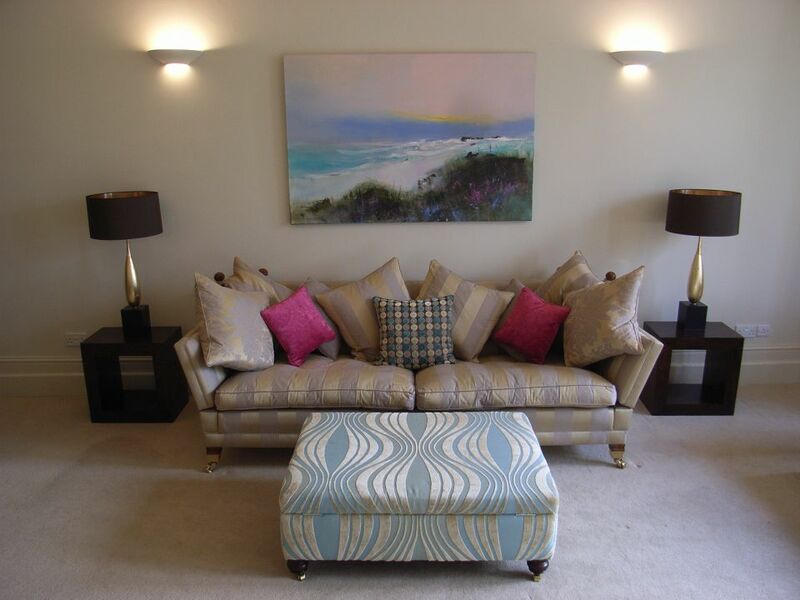 Accent lighting – lighting to pick out specific features in a room. Decorative lighting – where the fittings themselves are a form of decoration; perhaps a fancy shade, large size or vivid colour. Ambient lighting – light that is present around you from all sources. Natural lighting – from the sun through windows, typically. The kitchen in the image above demonstrates several types of lighting: task lighting from the pelmet lights and recessed ceiling spotlights; accent lighting from the uplighters on the cupboard tops; natural lighting from the glass extension (just visible) and windows; and ambient lighting from the combination of all. There is no decorative lighting here. A series of switches controls these lights depending on the need and the mood. This dining room contains most types of lighting: task lighting from the decorative ceiling lights; mood lighting from the table lamps and wall lights; accent lighting from the picture light; natural lighting from the window; and ambient lighting from all in combination. The pendants are also on a dimmer switch to enhance the mood further for those luvvy duvvy moments. Knowing these definitions will now help you to understand the type of light you need; so don’t try to read a book beneath a decorative wall light because the light won’t be good enough; you need a task light for this. 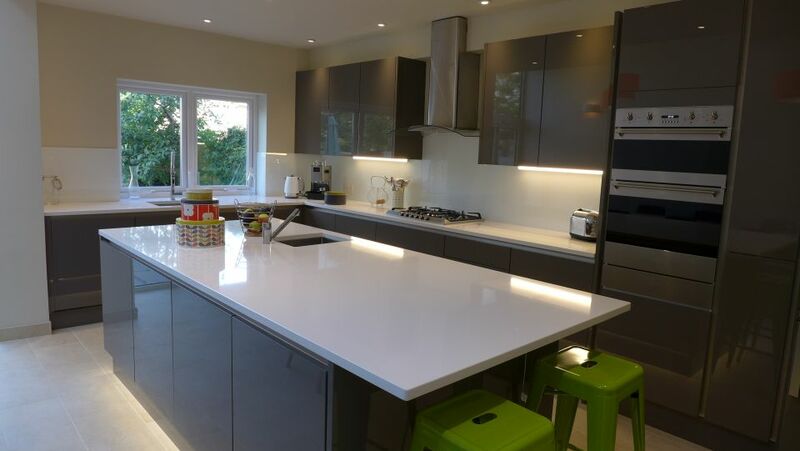 Useful in a kitchen or bathroom, we favour LEDs – make sure they are fitted so as not to cast shadows on working surfaces, including your own shadow – a major failing of central lights in kitchens. To clear a standard 300mm deep wall unit, we install lights 450 – 500mm from the wall to provide good light onto the worktop below. Spacing between lights is 800-1000mm, often dictated by the location of ceiling joists above. We spend much time measuring and re-measuring to balance the spacing once we can actually see the joists. We also recommend white bezels for a light coloured ceiling for the fittings to blend in with its surroundings; why make a feature of an uninteresting set of chrome rings? It is the effect of the task light that is important; a theme to which we return frequently. Fitted beneath kitchen wall units, pelmet lights illuminate the worktop directly. We’ve also fitted them to wall units above desks, and in bathrooms. Make sure you have an extra local switch for these. 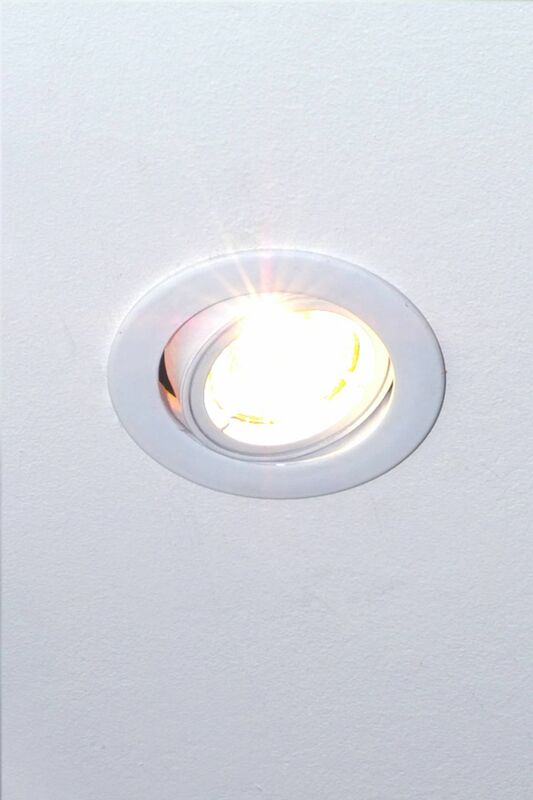 In the image below, we recessed these lights into the thick shelf, but for kitchen units with pelmets, you might try low profile LED strip lights (only 8mm high). Remember to buy the drive unit too, which you can hide on top of the unit or at the back of a cupboard shelf. Some modern kitchens don’t have pelmets. If so, we fit low profile pelmet lights to the rear edge of the wall unit, retaining enough clearance for the splashback. For kitchen units with a pelmet, we fit the lights at the front edge just behind the pelmet so it remains hidden. 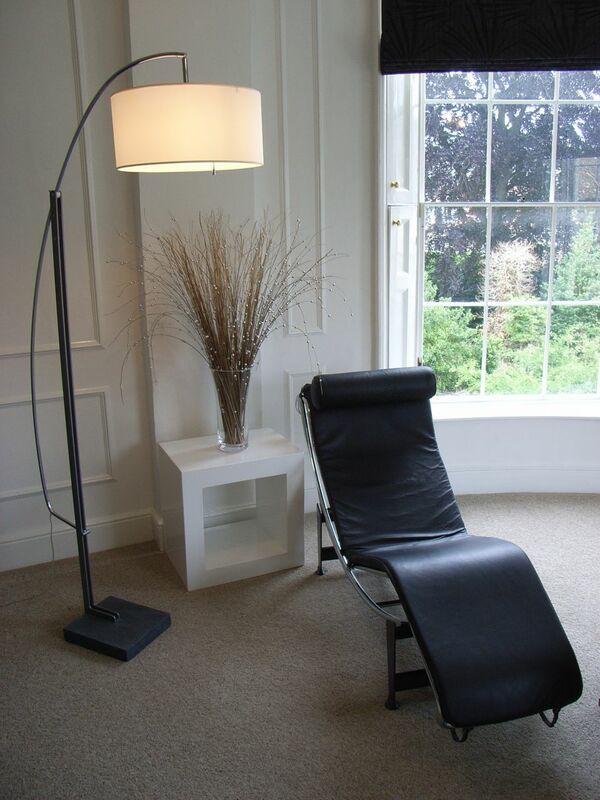 Floorstanding lamps adjacent to a seating area give perfect light for reading. 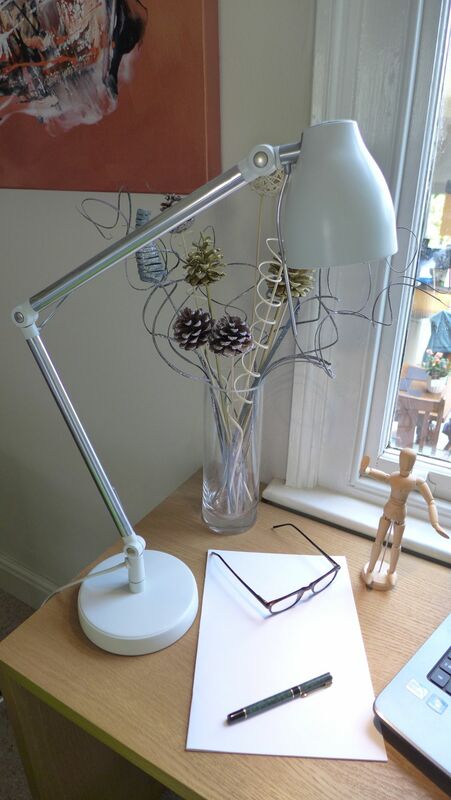 They can be fairly cheap (just a means of holding the bulb), or quite stylish as in this architectural lamp below. This bedside reading light is for reading in bed, surprisingly. Some home lighting designs fix these to the wall, whereas we integrated a pair of fibre-optic swan-neck lights into the headboard. These days we would use LEDs. Mirror cabinet lighting is crucial to help you see your face clearly for making up, shaving, or whatever else you do to your face. Make sure that the lights are positioned either side; cheaper cabinets with top lighting, cast unflattering shadows over your face making you look old, haggard and generally depressed. Desk lamps are particularly useful for studying. Studies show that you shouldn’t just rely on a desk lamp as it can be too intense and may cause eye strain. It is preferable to use one in conjunction with more ambient lighting to soften its effect whilst giving great light for the task. 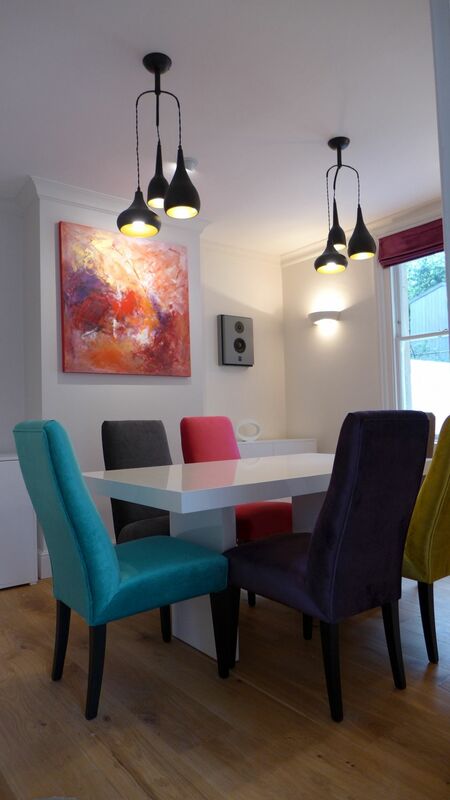 In this dining room lighting scheme below, we positioned the ceiling pendant lights to illuminate the dining table. A dimmer switch controls their brightness. 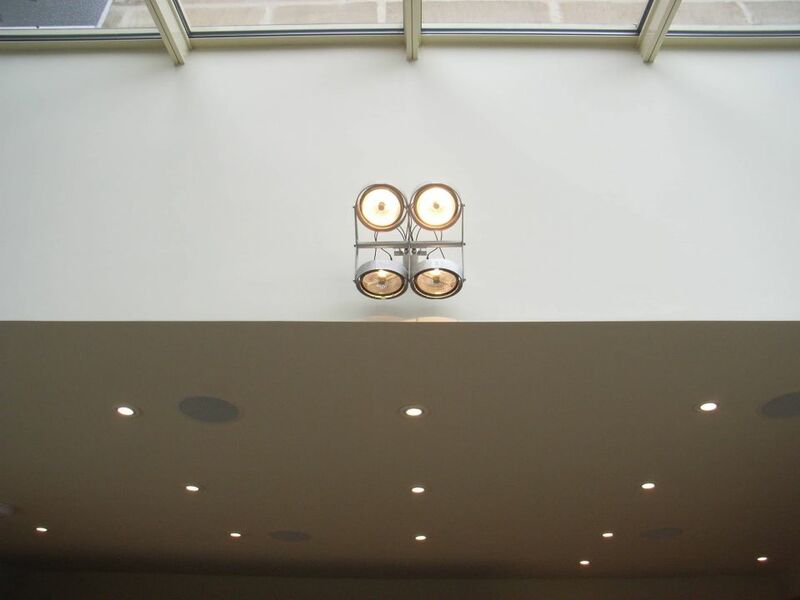 If you need to illuminate a space with no obvious fixings, such as a glass ceiling, you might consider cantilevered lights, such as in the image below. They come with various reaches. 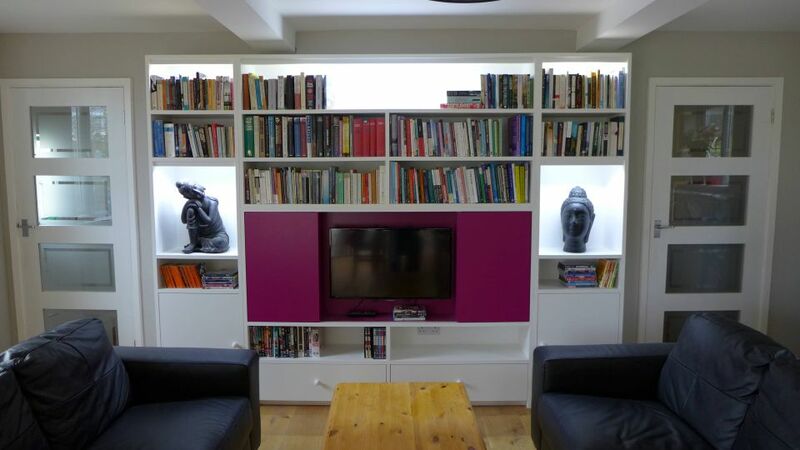 You should fit lights in cupboards and wardrobes wherever possible. 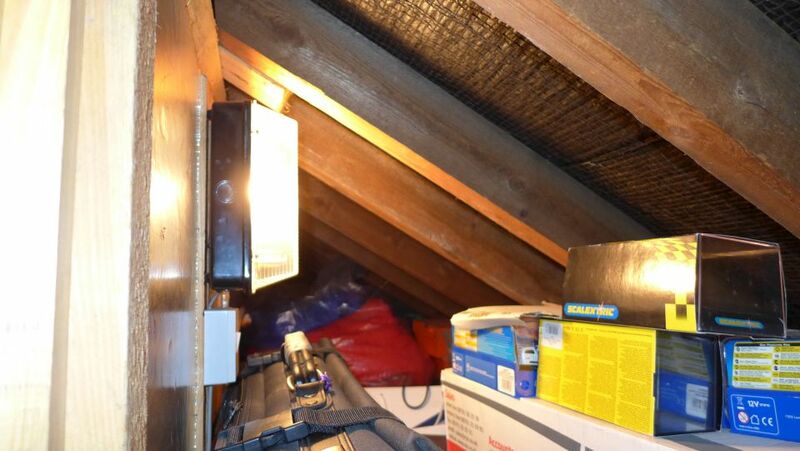 If you have a loft conversion and plan on making use of the eaves for storage, make sure you fit a light in there. A basic, cheap bulkhead light will do. 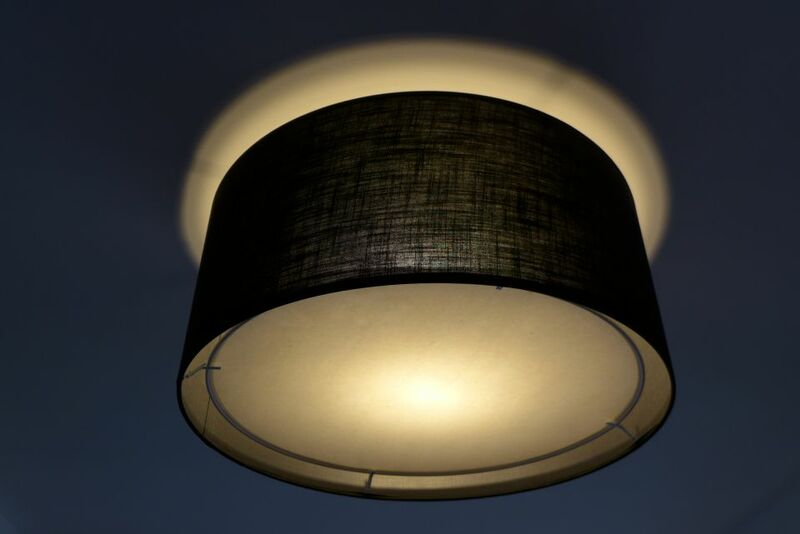 Batten light fittings are fixed tight to the ceiling and usually have a close fitting shade fitted. 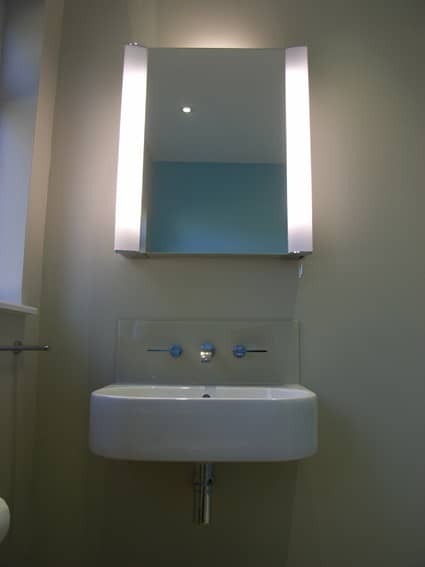 Providing task lighting in small cloakrooms and corridors, flush ceiling lights fit tight to the ceiling. Pendant light fittings hang from a flex or chain. 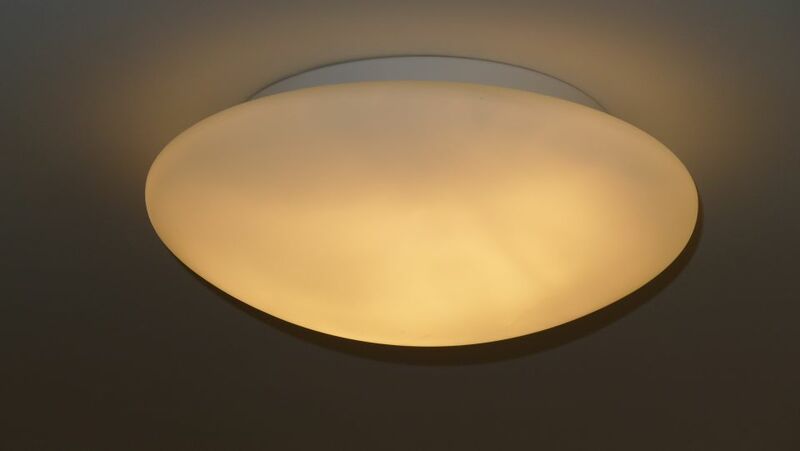 In older UK homes you would normally find a basic pendant as a central light source sending out a flat, depressing light. 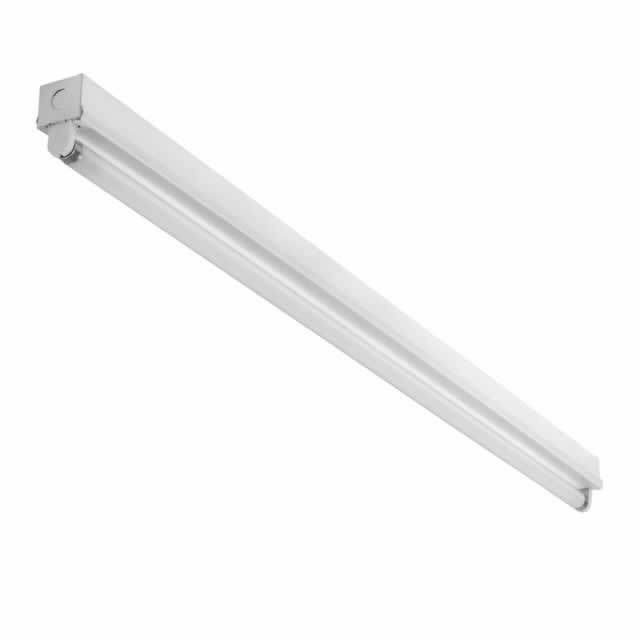 Fluorescent tubes are used as utilitarian fittings, often found in garages, utilities, and my Mum’s old kitchen. Older units emit a fairly depressing form of light, although more modern fittings in offices and so on are designed to offer a bit more inspiration. 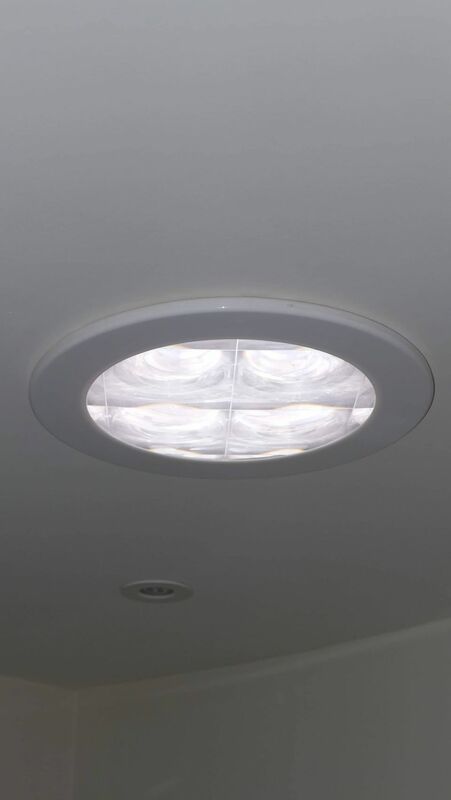 Track lighting fits into several home lighting categories. Because they are directional, they can be pointed at a desk to fulfil a task or at an ornament to provide an accent. With enough fittings, track lights also provide general background lighting. Tracks are usually fitted to the ceiling in appropriate lengths up to 3m or so. Longer tracks can be created by connecting several lengths together, whether straight or angled around the ceiling. Exterior lighting is key to a full home lighting design. Don’t forget that you may need to see outside from time to time; and to let you know when a badger is approaching the house. For close lighting we fit Passive Infra Red (PIR) lights (LED where possible) which can also be switched manually from indoors to stay on for a period whilst you attend to your bins, or water the plants. Below is an image borrowed from JCC. Accent lights pick out specific features of a home. There is some overlap between accent and mood, but we draw a distinction between discrete accent lights and decorative accent lights. 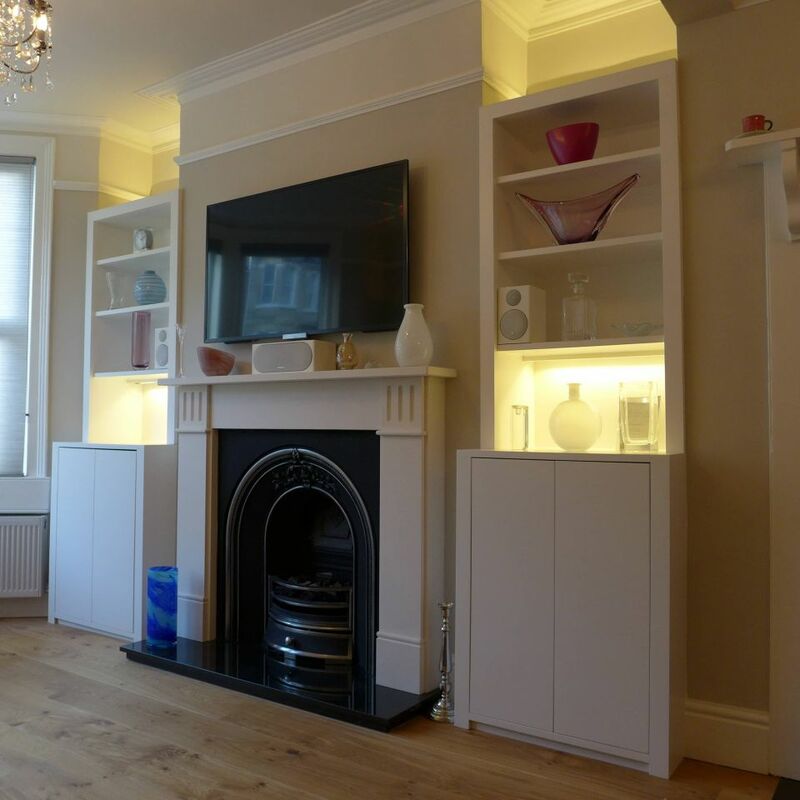 We prefer discrete lights because we believe it is the effect of the light that is important and you can achieve much of this with relatively cheap fittings. Later we talk more about decorative lighting. 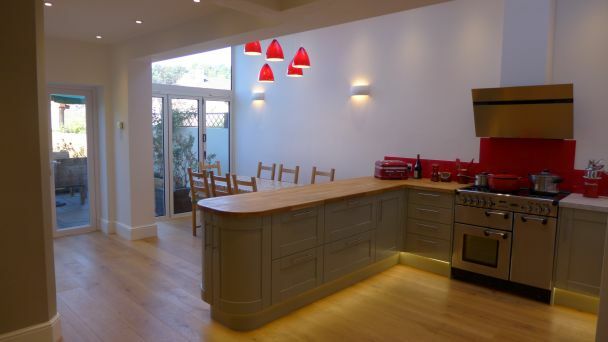 Plinth lighting brings life to your kitchen particularly at night, when your island looks like it’s floating. 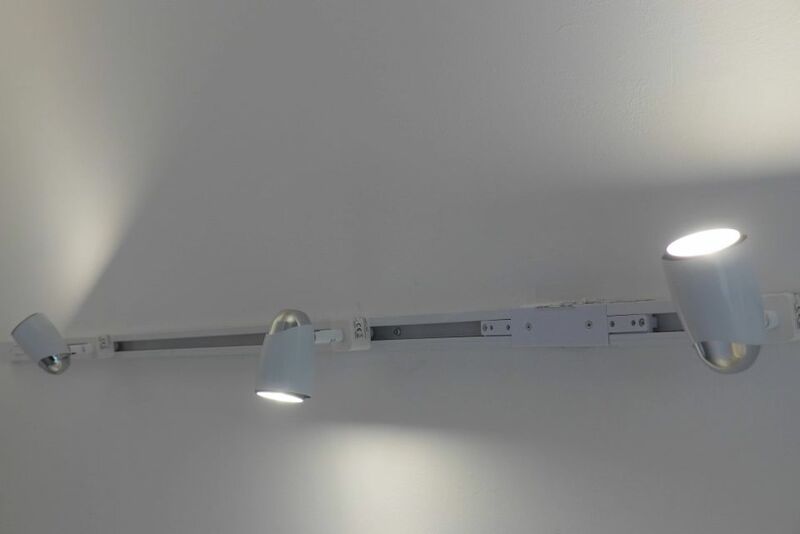 This continuous LED strip light is switched at the wall, with cabling set into the floor during the construction phase. Some picture lights are fitted close to the art being illuminated but we think this detracts from the art itself. 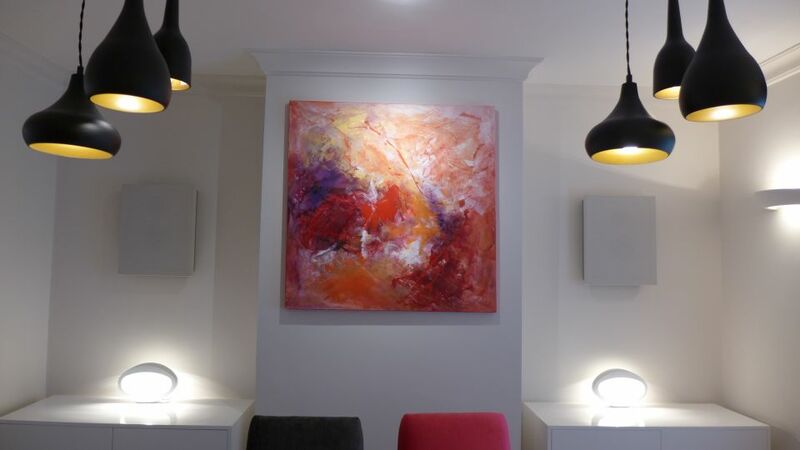 We light pictures remotely, here we installed a discrete wall-washer in the ceiling to bring the painting to life, like in an art gallery. This light is 500mm from the target, but you’ll need to check angles and dimensions in your case. 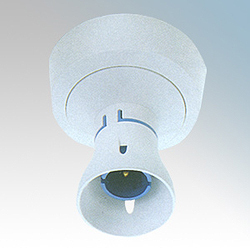 Recessed spotlights are often fixed in the ceiling but some have a gimbal for a small degree of rotation. 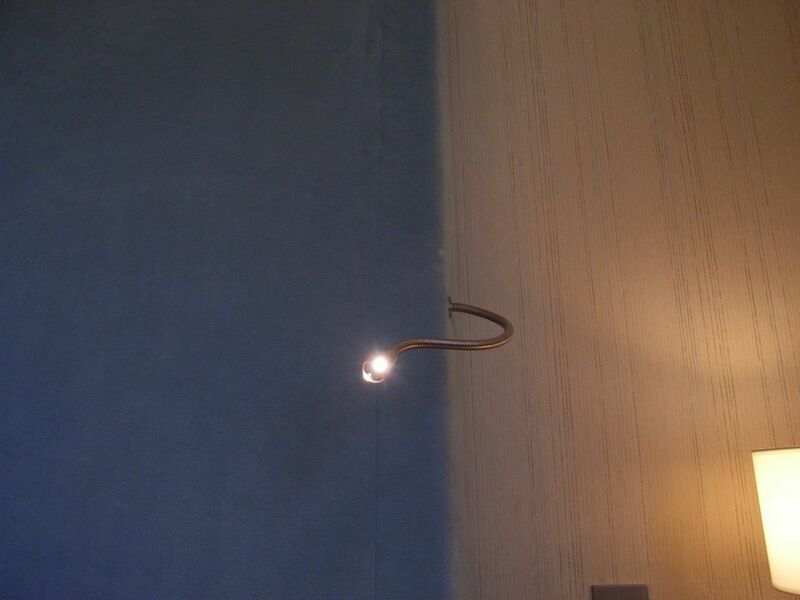 Wall washers are recessed lights that can rotate up to 90 degrees and cast light across a wall or ceiling. We use them to illuminate art or to light downwards from a sloping ceiling. Check the cone angle of the light beam emitted as they do vary: a narrow cone gives a focused beam, whereas a wider cone provides a flood effect. We commented earlier on the versatility of tracked spotlights. They fulfill a number of home lighting functions. Being highly directional we use them for specific highlighting. 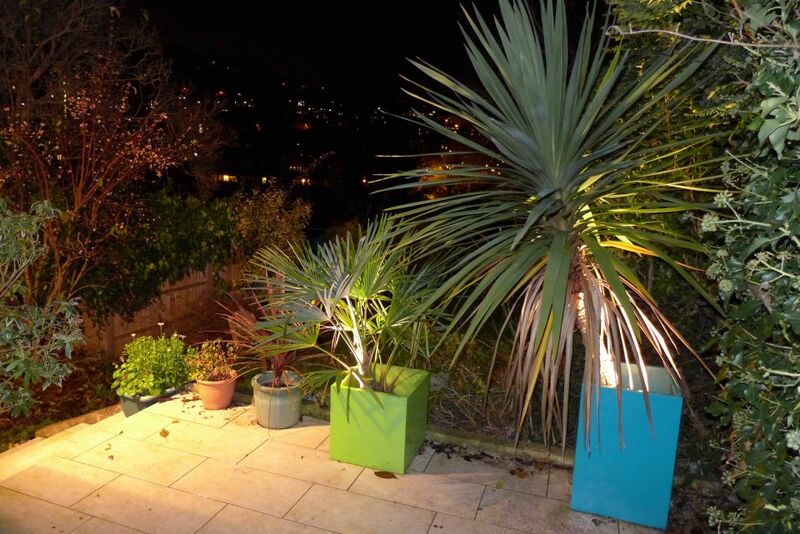 Another of our home lighting features is to fit LED uplighters into architectural planters to provide a stylish lighting effect on the patio. 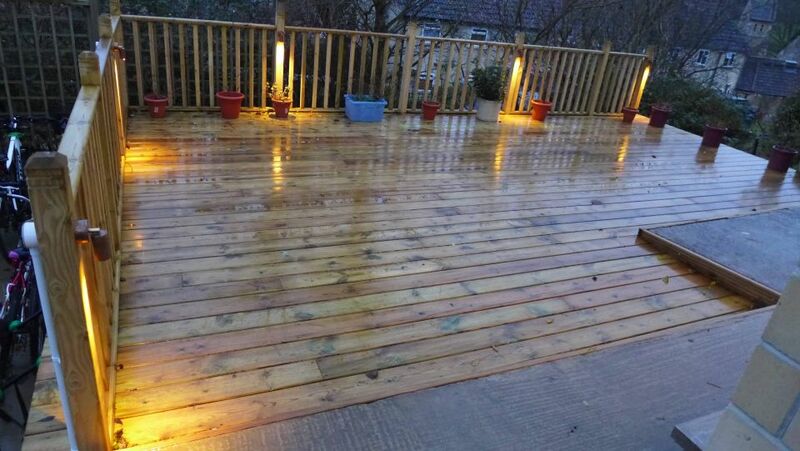 We also fix downlighters to posts to light up garden features, as in the second image below. Outdoor lighting must be installed by a qualified electrician using either low voltage fittings with transformers (don’t forget to buy the transformers too!) or mains voltage with armoured cable. Having gone to this effort, make sure you switch them on from time to time and enjoy the effect. Here is a series of copper downlighters fitted to deck posts. 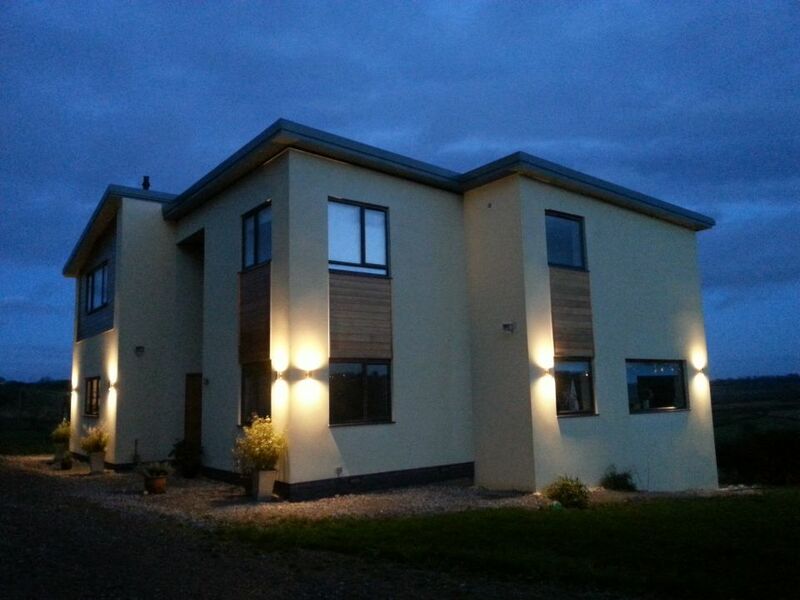 A house can look absolutely magnificent with carefully placed outdoor lighting. This all forms part of our home lighting designing service. We fitted these external up and down LED wall lights externally, presenting a beautiful vista on approach to this property. Alcove lighting offers its welcoming glow to living rooms and dining rooms. We fit low profile LED striplights into rebates to illuminate alcoves for dramatic effect. 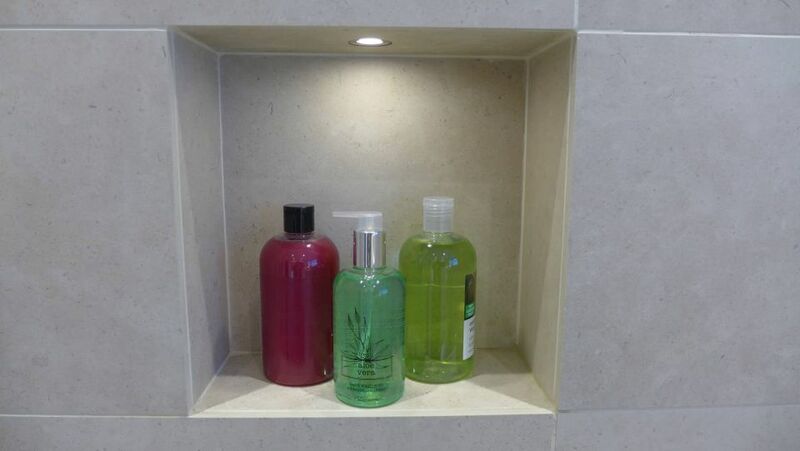 Alcove lights come in typical lengths of 300, 500 and 1000 mm. You can also buy longer lengths of flexible strip (or rope) on a roll. Don’t forget to order the drive units too (which you can hide on top of the cupboards), and check how many lights can be driven off each. You also need to check the length of cables supplied with the drive units to make sure they reach. Similar to the alcove lights above, shelf lighting offers a dramatic effect for any room. We fit low profile LED striplights in pre-formed rebates, so the fitting is hidden but the effect of the light is warm and welcoming. 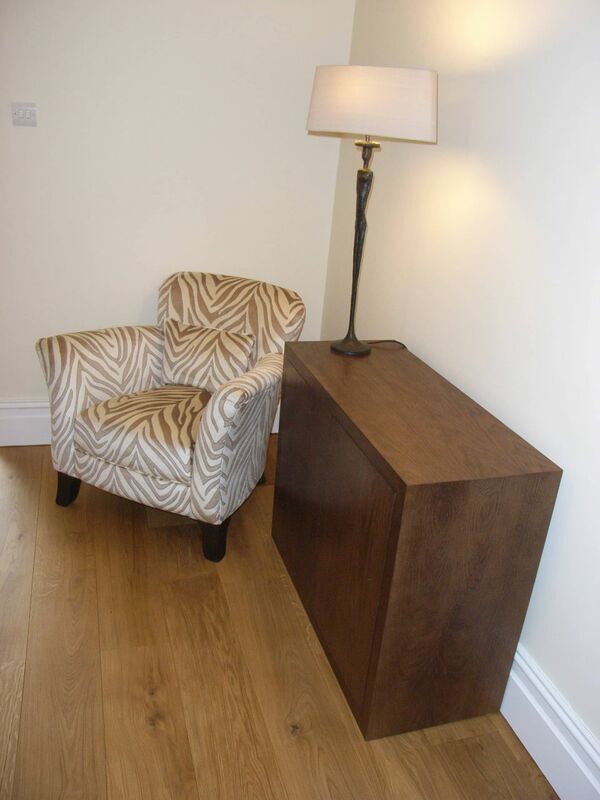 As part of a room scheme, we design bespoke furniture. Here, we wanted to make a feature of the curved niche, so designed a round glass-topped plant table. 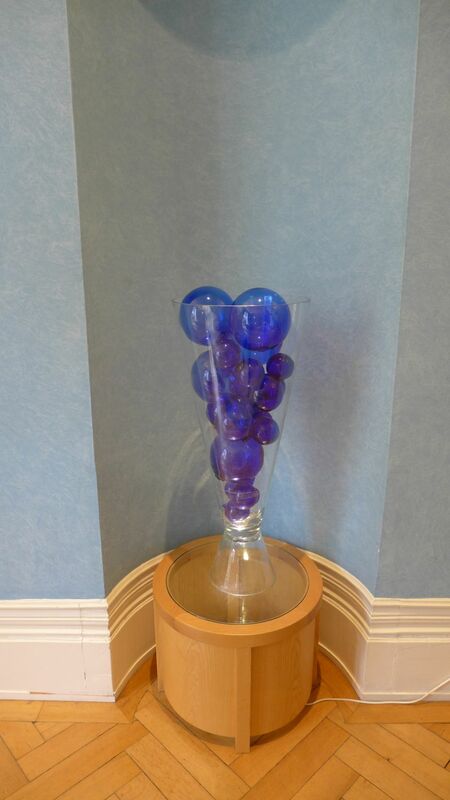 We fitted an LED uplighter inside so it could shine up through a special vase that our client filled with coloured balls. The effect was very dramatic, particularly at night. Step lighting is a bit of a luxury for a home lighting design, but it also helps with safety. Here we fitted cheap LED lights, recessed into the wall. 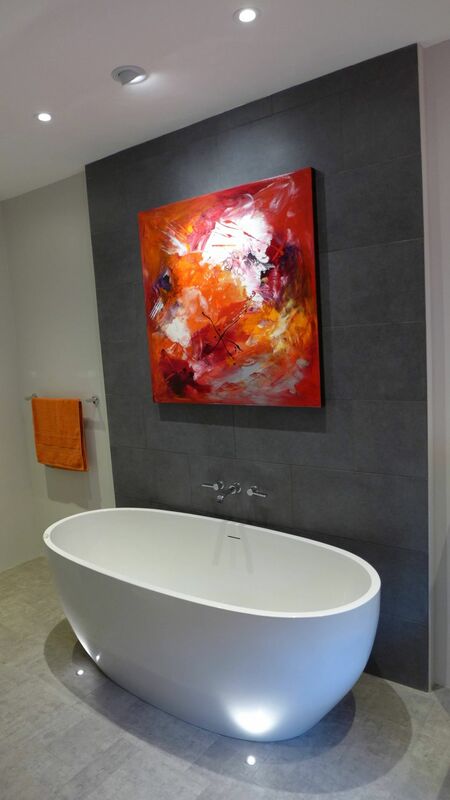 Another uplighter design, in this case creating accent lights for this freestanding bath. You need to be careful not to blind the occupants, but with careful positioning and choice of light, you can create a stylish effect. Here we recessed 1W LED marker lights set into the floor. Mood lighting creates a cosy atmosphere for a space, typically through a series of warm glows. Use of a dimmer switch will also change the mood significantly. Remember that dimmer switches usually require a deeper backbox than a standard switch, so check this with your electrician. Also check that you buy a quality switch as some of them buzz annoyingly. Living room lighting should have combinations of lights on different circuits to set the mood, including table and floorstanding lamps. 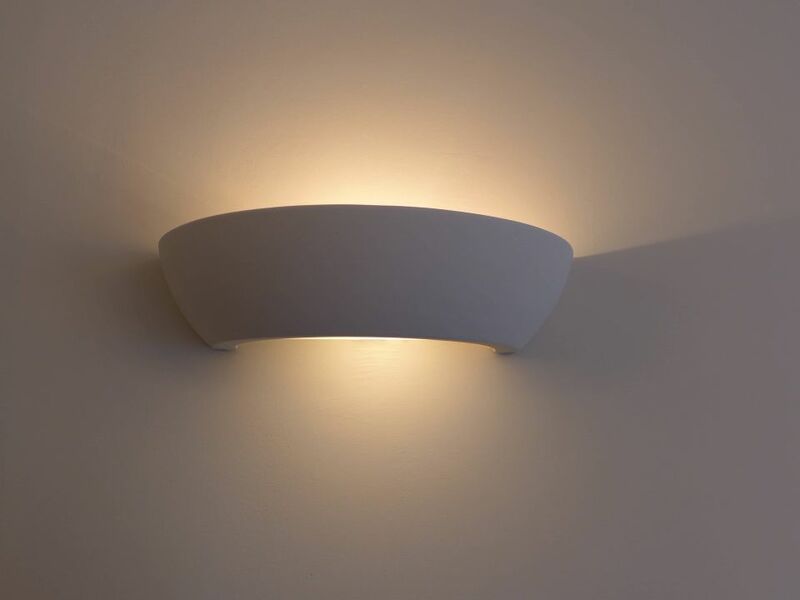 We like simple ceramic wall lights because they are cheap and paintable. 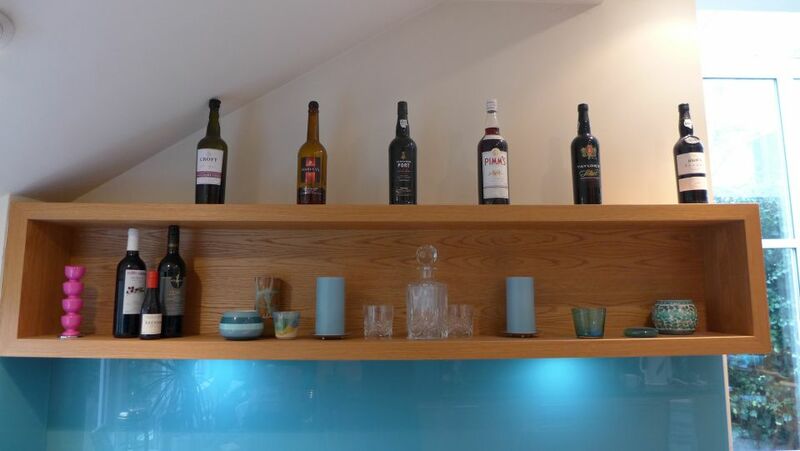 We blend them in with the wall colour allowing the effect of the light to provide a pleasing ambiance. Peripheral lighting is great for creating an atmosphere without detracting from the activity in hand. 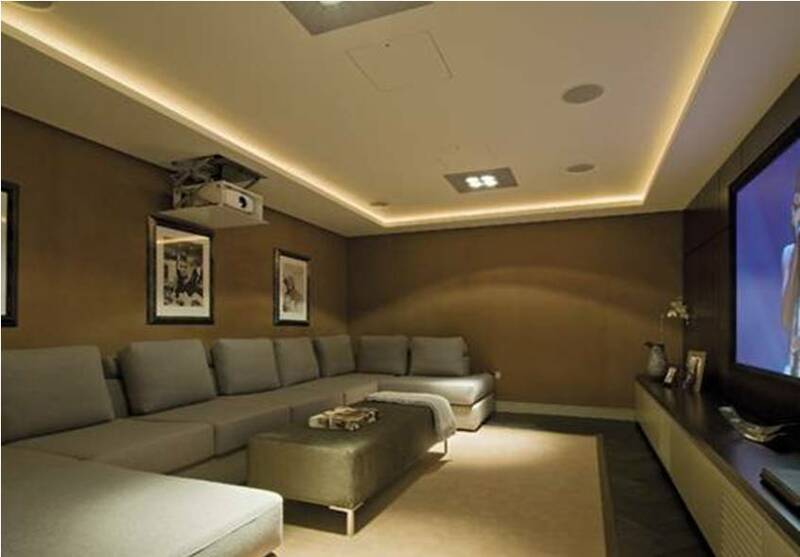 For example, it is great for a home cinema as in this image borrowed from Linden Concepts. We also designed one for a shop and for a cafe to provide an exciting effect around the ceiling. 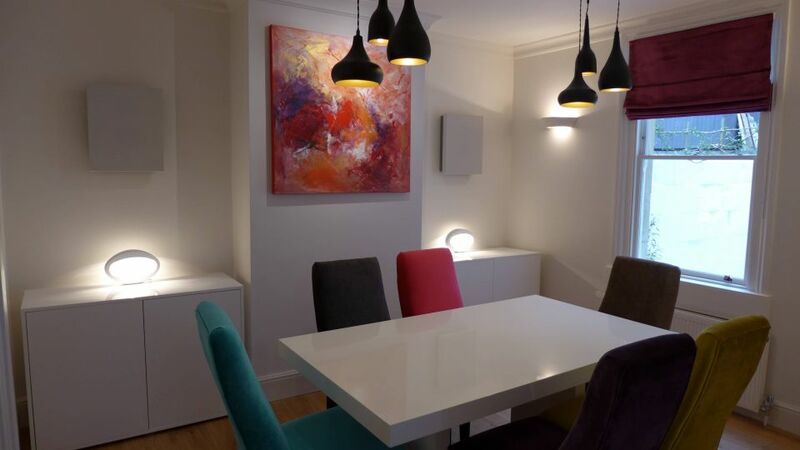 We also recommended this option for a TV show that was looking to create a home lighting scheme in a basement without using visible light fittings. 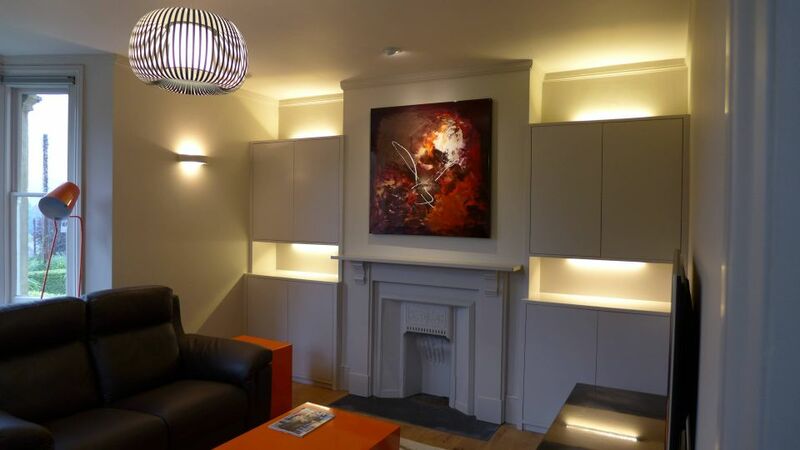 Generally, we like to create dramatic lighting effects using discrete accents; but we also enjoy using more decorative fittings when our design and the style of property call for them. Decorative wall lights are a feature in themselves. 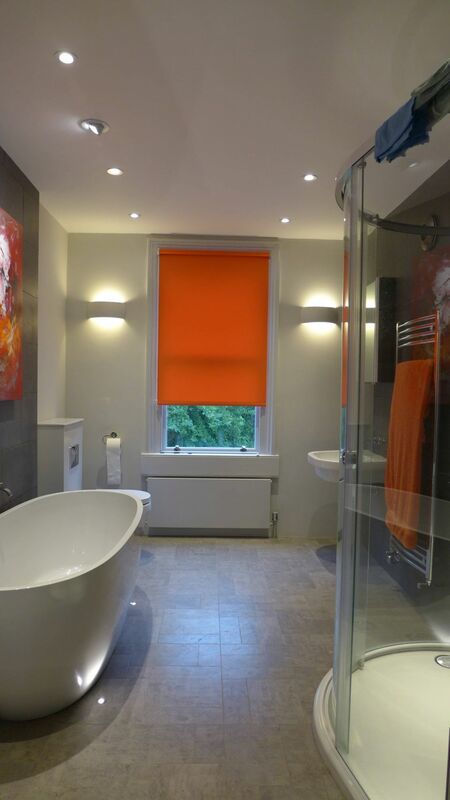 These understated half shades are stylish whilst simply complementing the decorative scheme. Decorative table lamps provide a focal point for a room. To be frank, this one is very expensive, but clearly makes a statement with its metallic, architectural lines. When used as task lights, these lamps also double as decorative accent lights. This bronze lamp is an interpretation of a male figure. 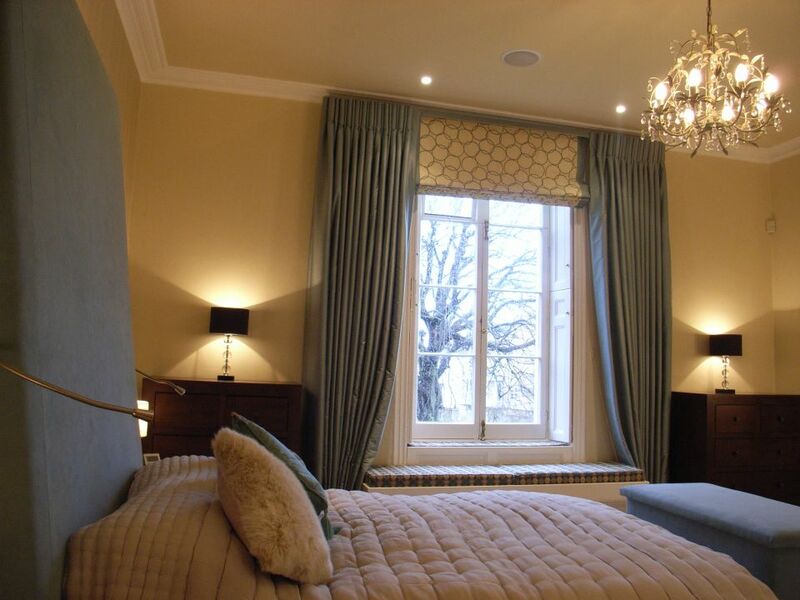 For this bedroom lighting design, we layered a number of lights on different switches to suit the mood. 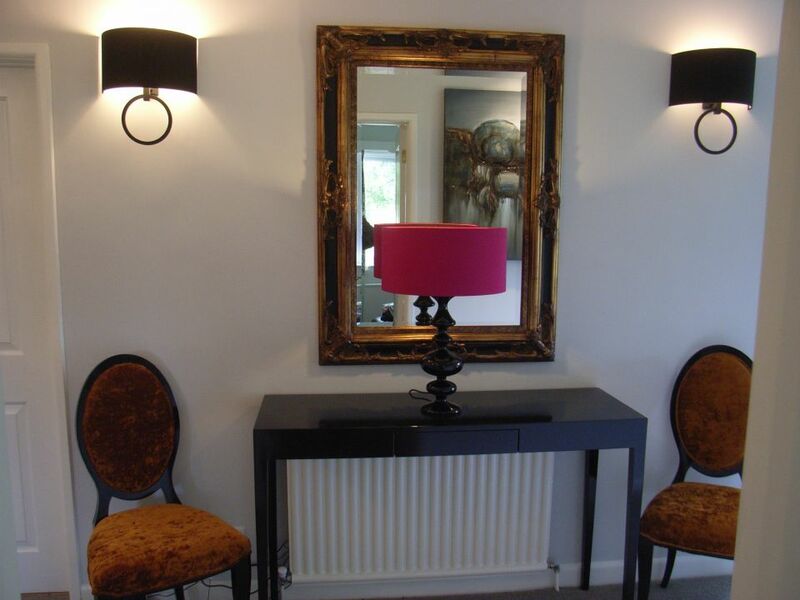 Decorative table lamps and a chandelier present a glamorous feel, but we also fitted recessed spotlights, reading lights, and film star lighting (not in shot) either side of a large mirror for a spectacular make-up space at the dressing table. Chandeliers are definitively glamorous, but they don’t need to be expensive. 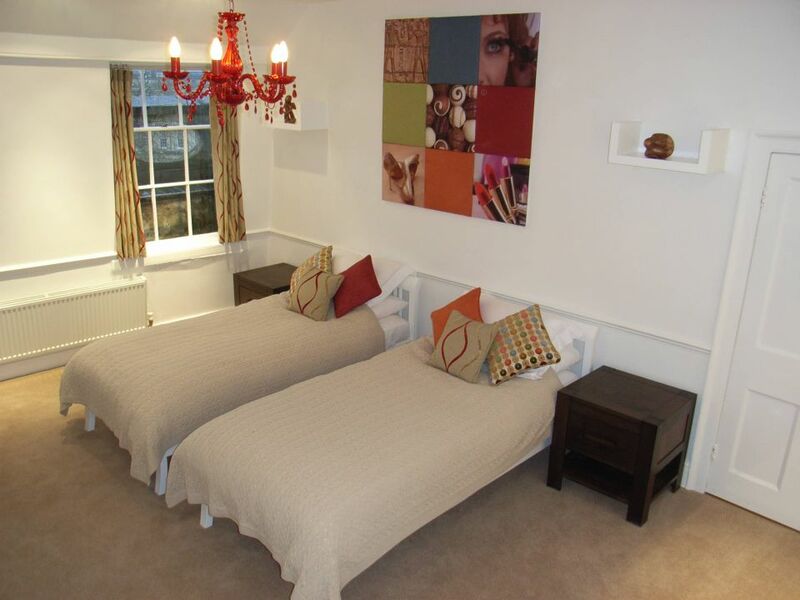 For these teenage girls we fitted a red chandelier to fit with the room’s other accents. Chandeliers don’t need to be fussy and glitzy. There are plenty of contemporary chandeliers on the market that nod to their fancy cousins, but sit well in a contemporary scheme. 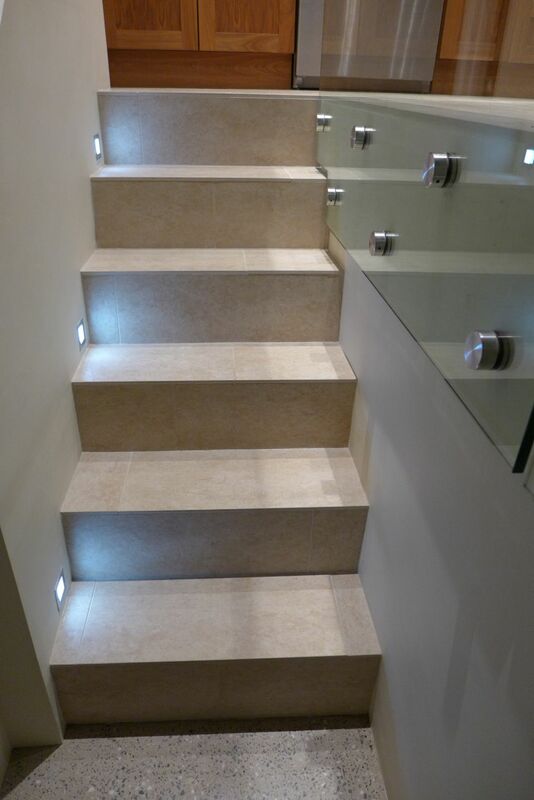 You have many options to light your halls, stairs and landings. 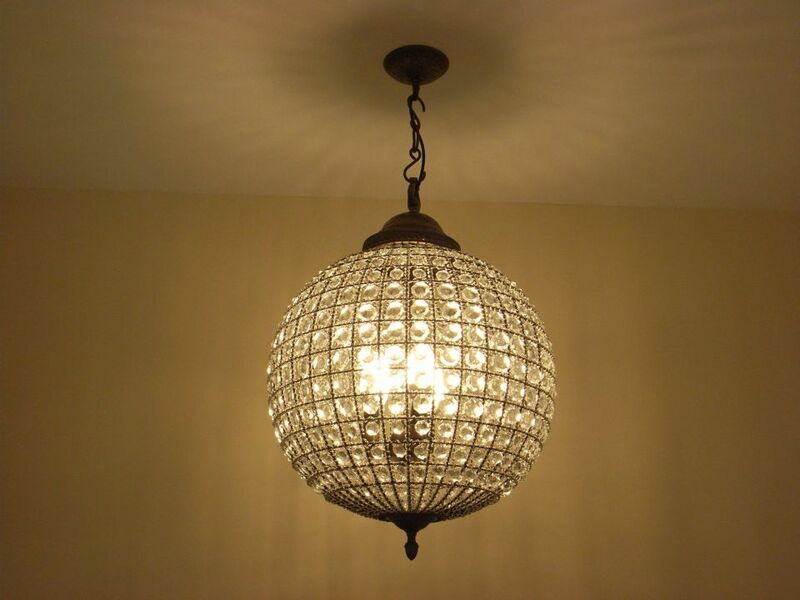 We’ve produced designs with chandeliers, globes and recessed downlights as well as table lamps. You need to watch that you don’t blind yourself coming down the stairs where you may be looking directly at the lamp (bulb); this may affect the design you choose or its location. Translucent globes are great because you don’t actually see the lamp from any angle; chandeliers are fine because each lamp is usually not excessively bright, but the overall effect remains spectacular. In this decorative lighting section we should mention lampshades. They come in many shapes, sizes and materials, and each offers a different lighting effect. Opaqe shades enclosed at the top will only shine downwards, as with these metal shades. Translucent shades will shine up and down with filtered light through the sides. 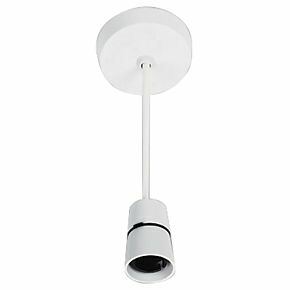 This ceiling batten light shade also has a diffuser at the bottom to prevent glare. Shaped shades will create light patterns on the adjacent wall depending on the design. 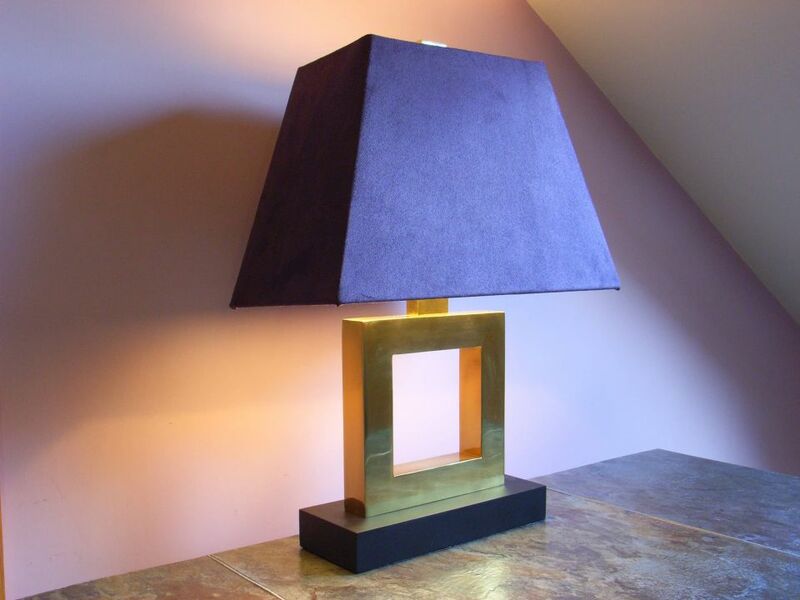 This opaque faux suede shade throws light up and down; more at the bottom than the top, because of its trapezoidal shape. Glass shades – glass shades are transparent or translucent. If transparent, remember that you will see the lamp (bulb) inside the shade. Is this what you want? Some lamps are a more pleasing round shape these days, and the ugliness of older lightbulbs is disappearing. However, the curly-wurly shape of some low energy lamps may still look out of place in your scheme. It is important to spend a little time talking specifically about bathroom lighting, because it is subject to rigorous regulation. You may be familiar with Ingress Protection (IP) ratings which dictate where such fittings can be fitted. 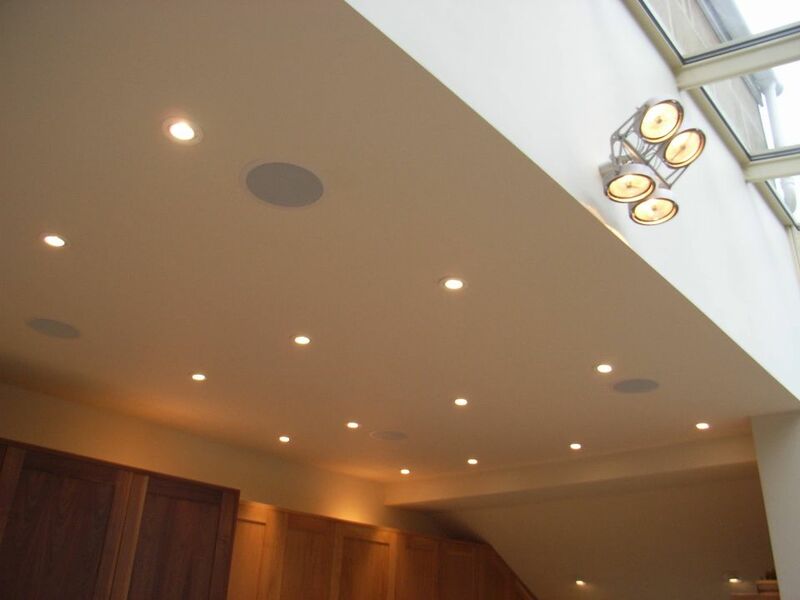 Essentially your qualified electrician will advise on the permitted IP ratings of the lights you would like to fit. In any event, he or she should always carry out the work for you. 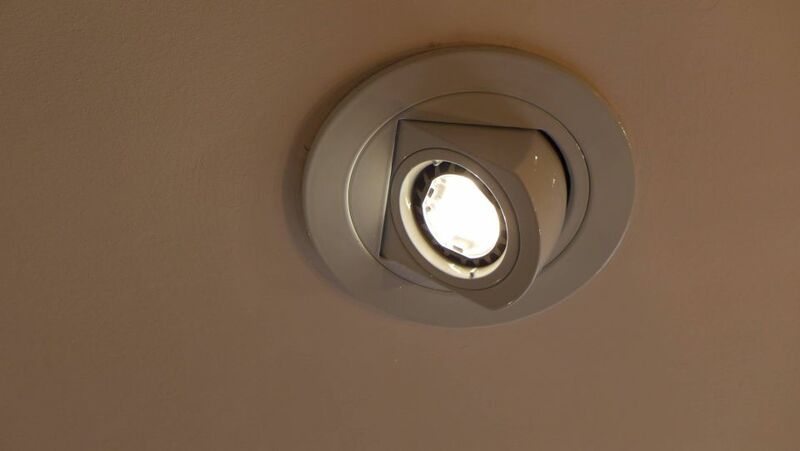 Below we fit IP65 fire-rated LED recessed downlighters above the shower and elsewhere on the ceiling; the wall lights, being out of a splash or shower zone, can be rated lower giving scope for a more interesting lighting scheme. We designed a number of these lights on the “mood” circuit for a more relaxed feel and for night time visits. Here are some other home lighting design features that you will need to consider to enhance your lighting design. 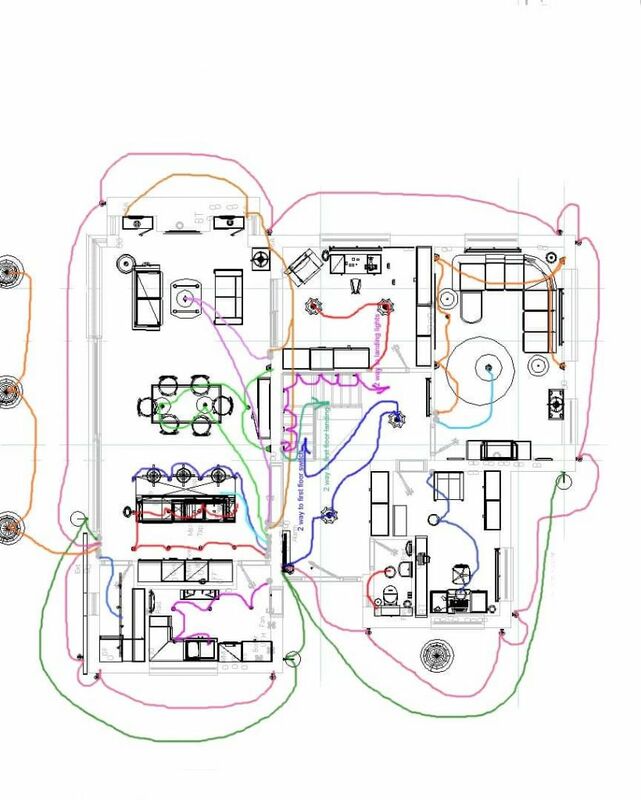 We look to design at least 2 circuits per room (one switch for each), so our clients can choose and combine lights flexibly to suit the need. Particularly important in large rooms, where you won’t need all the lights on all the time, look to zone the space and provide a set of lights for each. 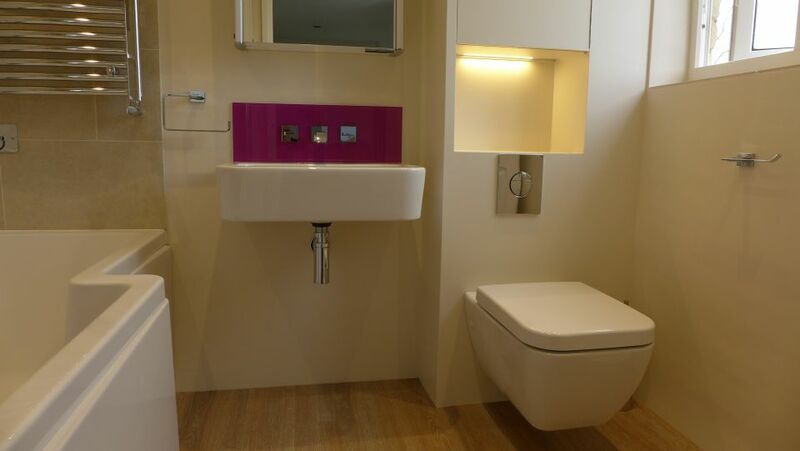 Even in a small bathroom we provide a main light for general use and low level light for night time visits. Two-way switches make your life easier. If you have a long room, it might be best to have a switch at each end operating the same lighting circuit. If you enter or leave a room from two distinct doorways, have a switch adjacent to each. Make sure you site switches within easy reach on the correct side of the door as it opens. Wherever appropriate, we fit table and floor standing lamps on a 5A circuit. This allows our clients to switch on or off all these lights from a wall switch, rather than switching each individual lamp (whilst still allowing for individual switching if required). your choice of light switch is wide and varied; simple and complex. You can choose to have your lighting integrated as part of a home electronic control system, an app, or a simple switch, dimmed or otherwise. If you settle for a simple switch, we suggest that you don’t try to make a feature of them; they are not particularly attractive so we tend to lose them into the background. If you have white, cream or light grey walls, a stylish white switch will be fine. If you plump for blues and purples and darker colours, then brushed steel or chrome will work better. 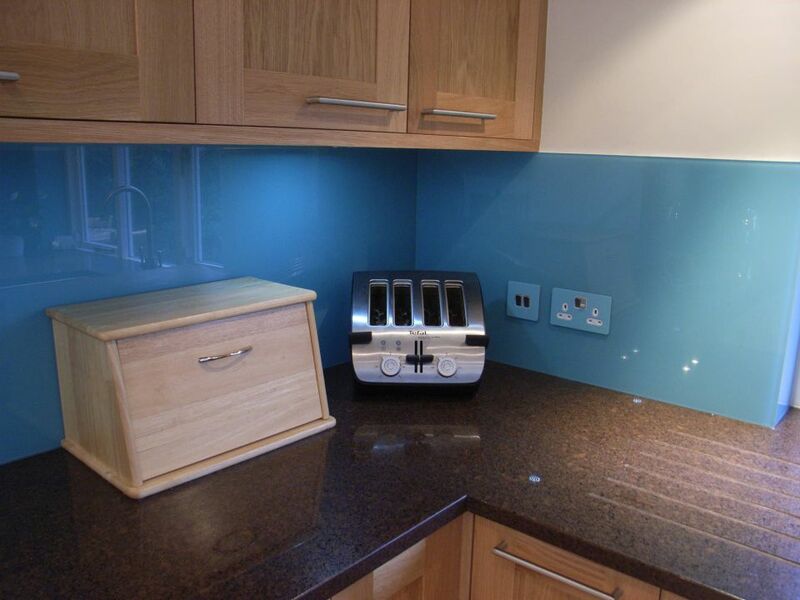 We even colour-match switches to glass splashbacks. We mentioned above that dimmer switches generally need a deeper back box than a standard switch; so check with your electrician. Also check that the lamps you have in mind are actually dimmable; some LEDs for instance are not, and you need to select dimmable versions specifically, which are more expensive. You will see light colours expressed as a temperature in Kelvin. The lower the figure the warmer the colour. As a guide: 2700K is extra warm white (slightly yellow), 3000K is warm white, 3500K is white, 4000K is cool white (with a clinical edge), 6000K is daylight. We find that warm white is bright and white enough for kitchens and bathrooms. 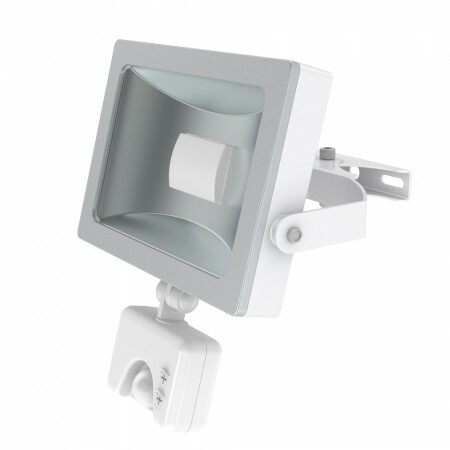 Manfacturers have started to produce 10W recessed LED spotlights – the feedback from some clients is that these are a bit bright; it is possible to dim them (when you purchase dimmable fittings), but we find a series of 7W lights to be perfectly adequate. You may be able to fit a glass panel in a wall partition to “borrow” light from an adjacent room (whether artificial or natural). 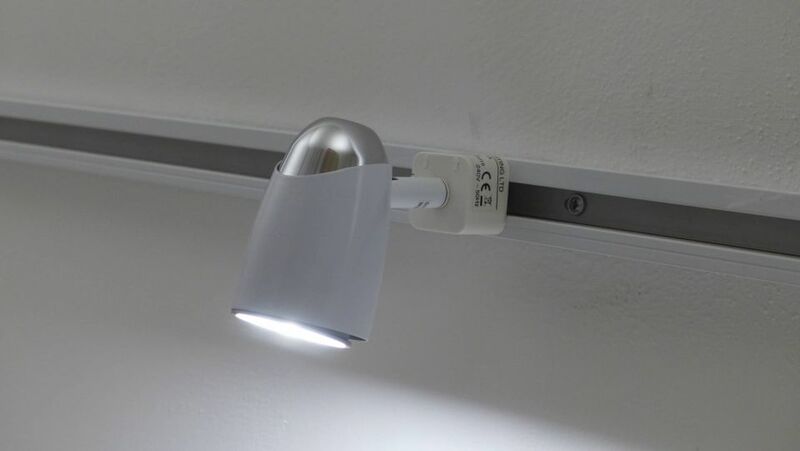 This may mean that you may only need to fit fewer lights in that space, or use a light less frequently if enough light penetrates from the adjacent space. We were amazed when we fitted one of these solar tubes for the first time at its effectiveness bringing natural light into a room with no windows. You need to choose the position for the collecting dome carefully on the roof to make sure that chimneys or other obstructions don’t cast shadows; a solar tube will not be appropriate in all circumstances. You can fit more than one if necessary. In a space of around 2m by 2m on a reasonable British day, our client did not need to switch on the lights at all. An uplighter shining on the ceiling will make the room feel higher, whereas low level lighting and light thrown downwards lowers the focus for a more intimate feel. To make a small room feel bigger, lights on opposite walls give the illusion of breadth; more so by adding mirrors to bounce the light around. To make a large room feel smaller, focus the light in defined areas – a few table and floor lamps near a seating arrangement defines that smaller zone clearly. To add interest to a room, place lights behind plants to throw leafy shadows on the walls. We also look to provide lights art different heights for a pleasing asymmetry. which light will go where, the colour (warm white etc) and therefore a specific model number. which lights are to be on a 5A circuit. which switches are to be 2-way. which are to be dimmer switches (or other control mechanism). Electrical work should be carried out by a qualified electrician. Look up the NICEIC, ELECSA, or equivalent website to find one local to you. Effective home lighting will enhance your decorative scheme, and have a positive influence on your life; it will make you feel good. Spend time thinking about the lighting you need and the effects you wish to create. We hope this guide has been of help. Please get in touch if you need more information or if you feel other helpful points should be included in this blog. 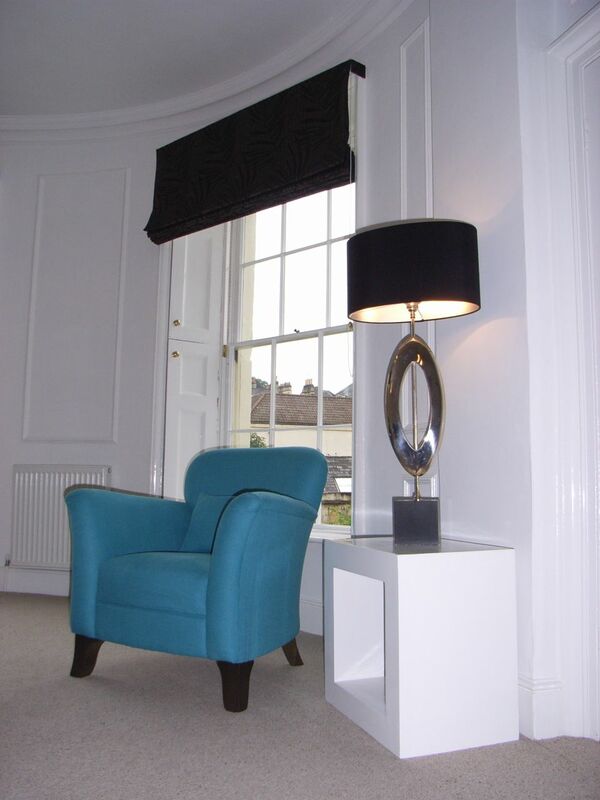 If you’d like more ideas for home lighting installations please read about our lighting supply.